An example of how, many brands used existing calibers and made them their own by personalisation, finishing and technical changes. In addition the dial remains the original and the overall design is classic Rolex with out following the DNA they became known for. The total number produced of the Valjoux 23 and the later Valjoux 72c was 126,583 examples. Manual wound chronograph ref: 4062, with 30 minute recorder at 3 o'clock in an 18k yellow gold case with coin edge decoration. Solid case back, made before the advent of sapphire glass backs on wrist watches. 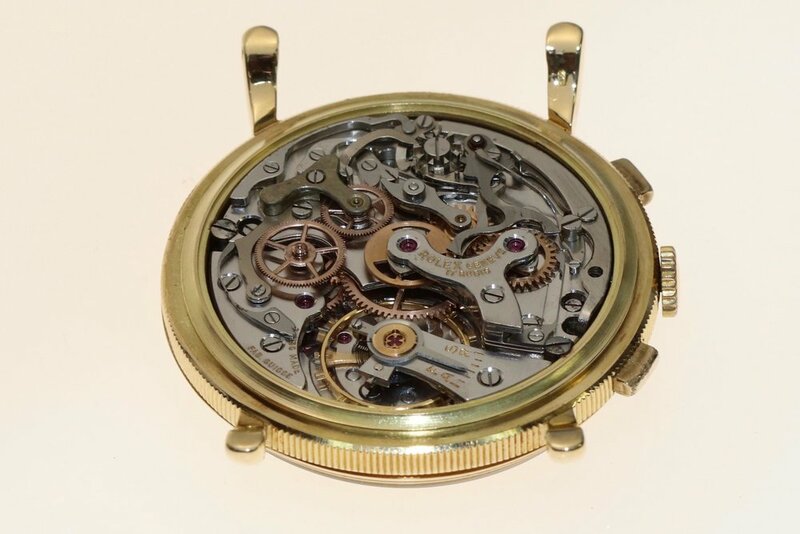 Many early pocket watches would often have a solid outer case back which could be easily opened revealing a second glass case back allowing the movement to be safely viewed. Vertical section of for return to zero of the chronograph hand. The dial is has a patina resulting from a deterioration of the surface over the last 60 years. The case was never water resistant and the dots which were originally radioactive luminescence, but are no longer and can be seen to have virtually burnt the dial around where they were applied. The hands were originally luminescent as was the dial spots. Often when vintage watches are restored the old non active material is removed and a modern non-radioactive material is replaced. The case is clipped together with snap back and bezel.